The Final Season of the Walking Dead starts out suitably bleak. I still remember teaching Clementine to shoot in the original season of Telltale’s The Walking Dead. It was, what, six years ago now? “You need to know how to protect yourself,” I said, and handed a gun to a eight-year-old, praying she wouldn’t need to use it—but knowing, deep down, that she would. Few moments have stuck with me like that one. Now, as The Walking Dead’s titular “Final Season” unfolds ($20 on Humble), we see how those decisions echo into the future. When the child who never had a proper childhood passes on her warped worldview to the next generation, what happens? The answer is predictably depressing. Editor’s note: This review only covers the first episode of The Walking Dead: The Final Season. We’re reserving a review score until the complete series is released. We’ve jumped forward a bit. Spoilers for The Walking Dead’s third season, A New Frontier, follow—but I assume you already knew that. 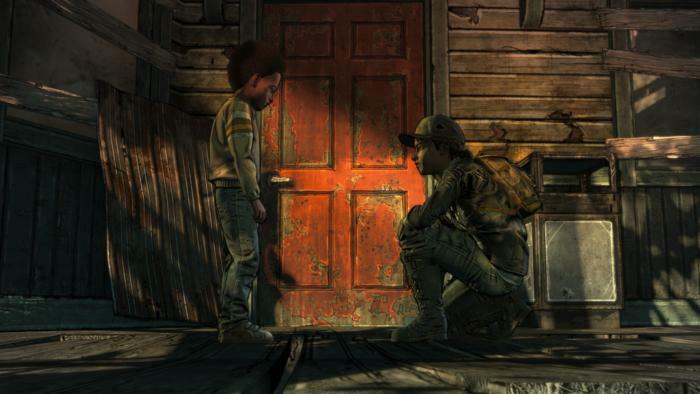 In any case, when we last saw Clementine she’d learned that AJ, the child she’d had taken from her early in A New Frontier, was still alive. She set off to find him and...that was it. I guess she found him, because The Final Season opens with Clementine and AJ together. They’re older now, and I’d hazard at least two years has gone by. Clementine’s in her mid-to-late teens at this point, and AJ is maybe four or five years old. He’s a character, in other words—not just a MacGuffin, like the last two seasons. And that’s complicated, because as the game is quick to inform you, “AJ is always listening” now. Just as Clementine once took advice from Lee, AJ turns to Clementine for advice. She’s his mentor, teaching him how to survive, how to shoot a gun, how to scavenge for food or hide from zombies. It’s like a warped mirror of the first season, in many ways, except where Lee and his group had to come to terms with the post-apocalypse, Clementine grew up in it. Where Lee tempered his advice with the expectations of the old world, Clementine doesn’t have that context. It’s heartbreaking. He’s right, in a world where every noise can call down death upon you, playing piano is a dangerous luxury. And yet it raises the question: If humanity is forced to give up so much in the name of survival, if music and art and even conversation are dangerous, is it really worth living? The Walking Dead has struggled with these questions in all its various forms, comic and TV show and video game, but rarely has it found such an elegant way to convey these ideas. Clementine and AJ finally get some room to breathe though. Maybe they’ve been on the road alone the last two years—it’s not clear—but The Final Season quickly throws you into a group situation, because as usual people foment conflict. This time you find Neverland, of sorts. 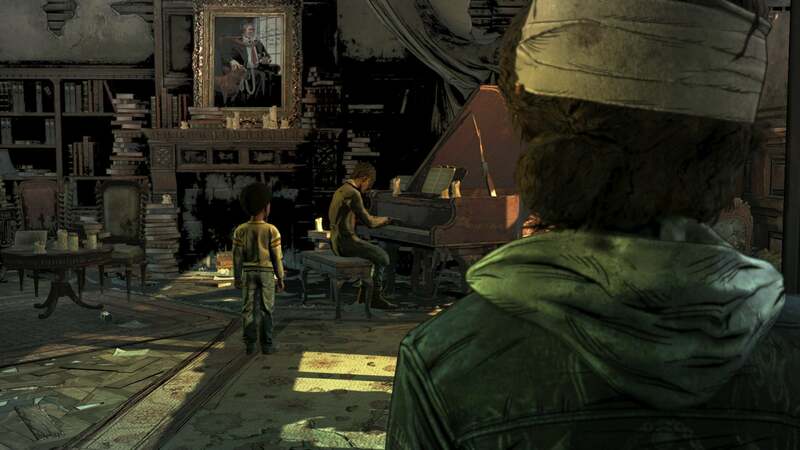 Clementine and AJ are brought to a boarding school where all the adults have fled, leaving a small and self-sufficient band of children behind. Marlon is the leader, a boy around Clementine’s age, buckling under the stress of trying to feed and protect 30-odd others. But other than the dwindling food supplies, it seems peaceful. Safe, even. Of course, The Walking Dead is rarely that simple and safety is usually an illusion. That’s true here, and this Lord of the Flies situation falls apart as the chapter progresses. 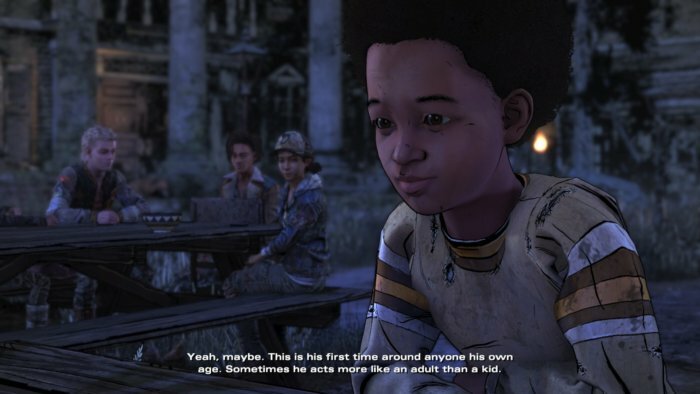 Most of the first episode is quiet though, with Clementine and AJ trying to adapt to (relative) civilization again, maybe make some friends. It’s hard to know what experiences they’ve had in the two years since A New Frontier, but you get the feeling it hasn’t involved many kids their age. Clementine is skeptical, as always. AJ is, if anything, even worse. He’s mean, he’s selfish, and he’s skittish. Sneaking up behind him is liable to get you punched or bitten. The question becomes whether you lean into that behavior or not. There’s a reason he’s like this, right? It keeps him safe. AJ never hesitates, never takes unnecessary risks. He’s a reflection of every skill Clementine’s learned over the years, honed to a sharp edge. And because of that conditioning, he’s survived. Civilization demands duller edges though. When AJ bites the person who sneaks up on him, do you chastise him for breaking the social contract? What if doing so results in his death later on? It’s complicated, and more than a little gut-wrenching. As usual, The Walking Dead is at its best when you’re given two terrible options and forced to choose. The Final Season is relentless in this respect, ensuring that no matter what you teach AJ will come back to haunt you somehow. Often it’s in ways you don’t expect though, and I think that’s my favorite part of The Final Season so far. It’s subtler than The Walking Dead’s previous seasons, at least when it comes to player feedback. The choices you’re making aren’t always called out as important, and it’s only when they resurface later you realize you had an impact. I’ve spent more time wondering “Could I have changed how this went?” in The Final Season than I have for any Telltale game in a long while. It also helps that the action flows better this time. As far as I know, The Final Season is still built on Telltale’s same old engine. Some major back-end upgrades have been done though, and conversations no longer stutter after every line like an old FMV game trying to load up the proper video clip. It’s seamless, and that helps mask whether you’ve just made a game-altering choice or merely picked one of many similar dialogue options with the same outcome. 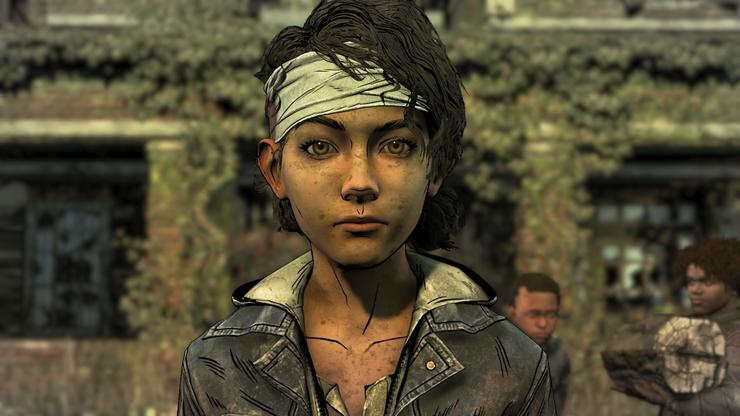 I’m excited to see how it plays out, and to take up Clementine’s story again. I didn’t hate A New Frontier per se, but it was jarring to watch Clementine act in ways that “my” Clementine never would. The Final Season ($20 on Humble) is smart to pivot back to its strongest character, and AJ as an added wrinkle is already paying dividends. Seriously, he’s a terror even this early in the season. As always, it’s a bit hard to recommend an episodic release off the strengths of the first episode. I have high hopes though. 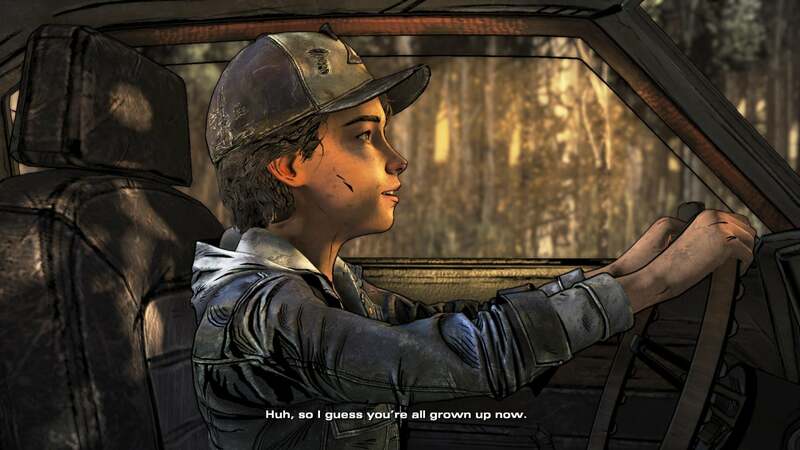 The Final Season managed to surprise me multiple times already, and if anyone deserves a satisfying finale it’s Clementine. Six years of build-up desperately need some sort of catharsis, even if it’s a tearjerker.